The Legend of Legacy created and owned by FurYu and Atlus. Boiling Sea is available as a map when you first set foot in Roaring Valley, purchasable for 1,000 St. As far as I know, this is the only way to reach Boiling Sea. Lizardman Sentries. Strictly physical hitters. Smack ‘em around and defend yourself. These guys appear as shadows in the water, and, as far as I can tell, under no other conditions. Lizardman Marauders. These pink versions of the Sentries hit harder and can take more abuse. Thaaaaat's about it! You won't see them very often. Stormrise Coatls. Essentially more advanced versions of Coatls - and often appearing in clusters of their lesser buds - they hit a lot harder and can take more abuse. Wipe them out first, if you can, 'cause Coatls shouldn't be much of a threat by this point. - You start off in the southwest corner of the map. Wander northeast and you’ll find an ancient machine which you can - and should - activate. This will not only make water elementals flood into the area, but it will allow you to cross some of the watery areas nearby. This is a necessity for traversing the area. Beside the pedestal is a nest of eggs which you can attempt to plunder to face Coatls. Beat them for a Giant Egg. - Head north from the first island, across the water. There’s a potential Sparkle on one of the rocks along the western wall, and on the northern-most island you’ll find two nests. Just east of this island is another rocky outcropping with a potential Sparkle. - There are two eastern exits from this map, one in the north and one in the south. If you followed these directions you’ll finish the map by heading south, so we’ll start there. 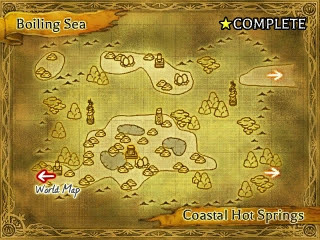 Boiling Sea's Shoreline Trail in The Legend of Legacy. - You’ll pop out in the southwest. 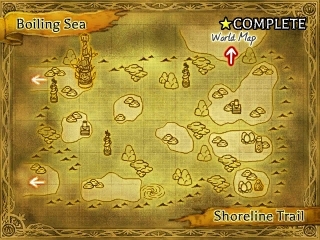 Head east to find another small island with two potential Chests. There’s not much else to see down here - you’re blocked from heading too far east - so head north. There’s an ancient device in the northwest, a yellow pedestal that will net you a Giant Egg roughly in the middle of the area, and plenty of chances for Sparkles. Watch out for water spouts, as they’re much more numerous out there. - Your destination’s in the northeast, but don’t go there yet. Explore the eastern islands first. There are two more nests down here, and in the southeast corner of the map you’ll find a singing stone. It offers up a Whispering Shard for the Enkindle charm. Once you have this, wander to the northeast to find an exit. Yep, that’s it for Boiling Sea. IMPORTANT NOTE! In the not-too-distant future, Boiling Sea will be eliminated from the game as an explorable area. It's the only area that suffers this treatment. There's not a ton to see here, aside from the Whispering Shard in Shoreline Trail, but make sure you fully explore this place before you collect all three Singing Shards, activate all three sets of Ruins, and visit the cairn in Deserted Village. Just saying.